The Hoover Dam is simply massive, and I want to say one of the most impressive pieces of architecture…but it’s a phrase I’ve been uttering too frequently these days. Perhaps I’m just seeing humankind outdo itself again and again around the world; yet let’s focus on the history of the Hoover Dam, equally as fascinating and a bit spooky at the same time. The Hoover Dam was almost never built, not only because its feasibility wasn’t certain, but it remained a tough political sell right in the depths of the Great Depression. Eventually however, between the years of 1931 and 1936, the Hoover Dam was built on the Colorado River where it divides the states of Nevada and Arizona. A total of 112 people died during the construction of the Hoover Dam, the first was surveyor J. G. Tierney in 1922 (while looking for the ideal spot to build the dam) – the last was Patrick W. Tierney – his son. He actually died 13 years to the day after his father. The entire history of this dam is thoroughly covered in detail in Colossus: Hoover Dam and the Making of the American Century, a book you should delve into to truly grasp what an undertaking it was and the effects of the Hoover Dam on the environment today. 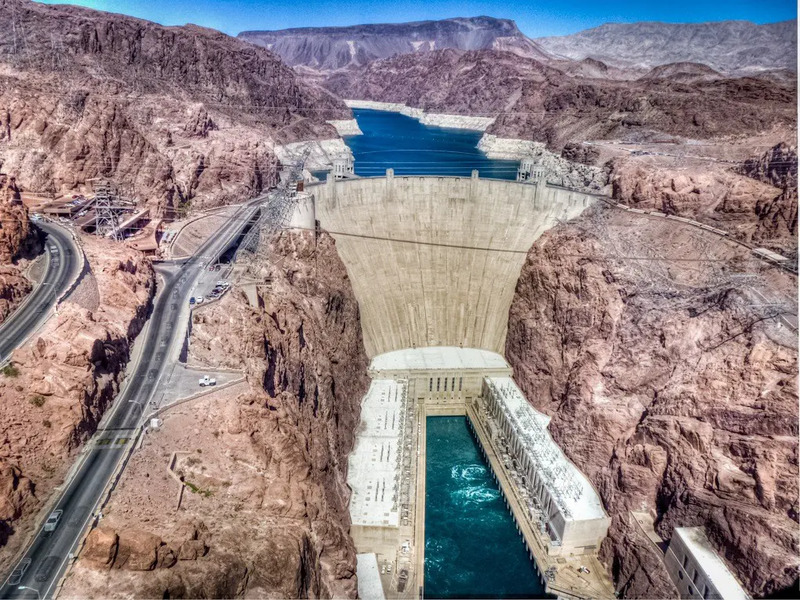 Aside from the Hoover Dam itself, two notable landmarks were born from its creation – Bolder City (created to house all the dam workers) and Lake Mead – a result of water accumulating prior to flowing through the dam’s electrical turbines. For more of my photos from the Hoover Dam and surrounding areas, check out my album here. Where did you get this view? Helicopter? I was there a year ago this time and they hadn’t opened the new bridge yet that they built – I’m wondering if you took it from there?! Regardless – a lovely pic! Anil, I have a book near publishing title, “Murder in the Valley of the Dammed”. The setting is in a small town south of the Boulder/Hoover dam and I am looking for a photo to use as my cover. Your photo is one of 2 or 3 I really like; thus, I am seeking permission (credit to be given on inside cover) or information as the possibility of using your photo. My book is going to press within the next 2-3 weeks so I would appreciate any assistance you may extend. Feel free to email me to discuss further, I’ll try to get back to you as soon as possible.